If you could put Rick James in a mosh pit this album would be the soundtrack. The sharp, prominent, and unorthodox vocals, bold guitars, and catchy lyrics take us on a dark and complex journey through the most eccentric of sideshows. 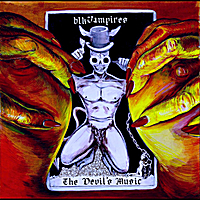 blkVampires is a Hard Alternative Gothic Soul band. Marilyn Manson meets Maxwell. Pantera meets Al Green. We are the first all black band featured in Fangoria magazine. We have a novel coming out in October. HarlequinX, a new character in horror, a la Freddy Kruger, Michael Meyers, Jason Voorhies. They will also be featured in the soon to be released documentary Riot On the Dancefloor.